Jailbreak: Voice Onrush is based on a Nintendo DSi Ware game (Escapee GO!) and is ported over to the iPhone and iPod Touch. The game has a very simple storyline to it and it goes something like this: You wake up in a cell with no memories of your own. All information of yourself is unavailable and you are being hunted down by an unknown enemy for god knows what reason. You have to run away from these people, escape and save yourself. With the aid of new found powers along the way, you have to succeed in escaping from the enemies’ hands. 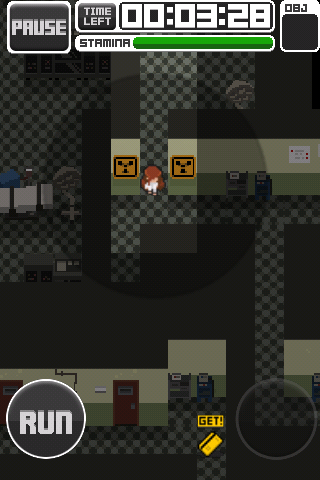 It plays like a pacman survival escape game. You are being chased by these people in different levels and all you have to do is to not get caught by them and find the exit. Levels are designed in a way of a puzzle. You basically get routes all over one particular level and enemies within certain parts of the routes. If spotted by the enemy, they will start giving chase and you try your best to twist and turn to lose them. 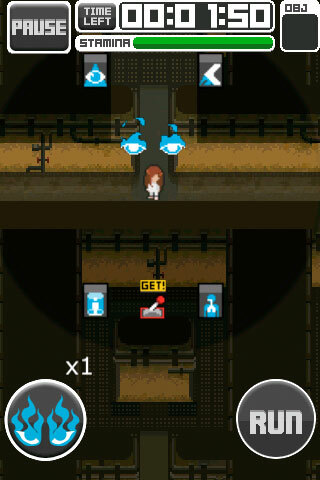 Within each level, there might be some objects (triggers) that you have to obtain before you are able to escape and proceed on to the next level. Level designs are rather interesting and exciting, especially when you don’t know what is coming right ahead of you. The game has a view range system where you can only view routes where are not blocked by walls. This means that before you reach a “T” junction, you have no idea what lies at the right or left. You only get to see paths that are unblocked by objects. This creates the anxiety and exciting atmosphere. I mean this also meant that you have to strategize the way you plan your path as well. You don’t want to walk into a junction attracting the attention of the 2 guards left and right of you. Sometimes you would want to walk slowly and find paths with less than 2 openings, leaving yourself secure to run away should there be someone in front of you. Nonetheless, a great system implemented which makes the game a whole lot more fun and thrilling. There are also different types of enemies present within the game, each with their own ability. There are the basic guards who only give chase, agents who can chase really quickly, soldiers with range abilities (shooting trap nets) and the hunter whom you want to avoid at all cause. There are power-ups within the game which are extremely vital in your progress to escape from the enemies. There are power-ups that increase your movement speed, give you unlimited stamina for a certain amount of time and also power-ups that give a wider visibility range. All of these are important for using one of them might change the situation when you get caught between two enemies or so. For example if you meet a dead end and an enemy is fast approaching onto you, use the teleport power-up (if you have it) and teleport to safety. The power-ups are a nifty addition to the game. There are 3 control schemes that you can choose from. One is by flicking, second a d-pad and thirdly the tilting controls. The d-pad and tilting scheme did not work smoothly enough for me. D-pad felt rigid and clunky, tilting simply doesn’t work when required. Nonetheless, the flicking control scheme works perfectly well (in my opinion). Flicking is done simply by flicking the direction you want to move in that direction. 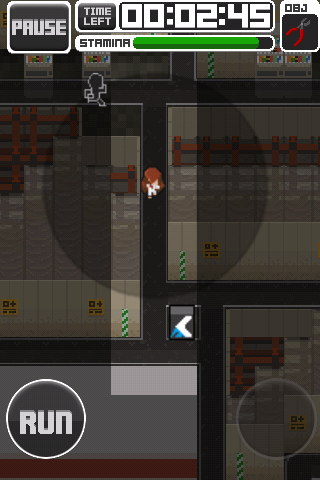 Tap on the screen once to make your character stop moving. That is simply all there is to it. Works much better than the d-pad and tilting controls. There is the option to run as well. Running is extremely important for survival and escaping. When unintentionally catching the attention of the enemy, running allows you to out pace your chaser. When not running, you are often caught in the situation where the distance between you and the chaser getting shorter and shorter every second. There is just one problem to it though; you cannot run forever in the game. This is due to the stamina bar which limits how much you can run between a stipulated period of time. Depleted stamina bar results in your character not being able to run. You have to rest and wait till the bar refills before you can run again. This again makes the game more realistic and much more fun to play. I mean who wants a game where you can simply outrun every single opponent you see? It’ll be way too boring and easy. There are a total of 3 game modes that you can choose from; Story, Free and Survival. Story mode is simply the main storyline where you play through all the different levels with the ability to choose from 3 different difficulty levels. Free mode allows you to replay those exciting levels and try for a new completion time record. Survival mode is unlocked once the story mode is completed. In survival mode, you simply have to survive within a level as long as you can and set the highest record time possible. You cannot stay in one corner and not move though since time has to be replenished by collecting orbs. In search of the orbs, make sure you do not run into any of the hunters or guards! 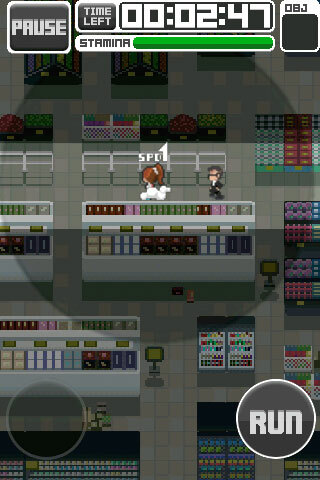 The game graphics are that of the retro pixel styled graphics. I love pixel styled games so I might be biased in saying that the game looks great. But overall I bet it’ll be pleasing enough for the general public. The level environments are well designed and the themes of each levels are brought out strongly with the objects and setting design within the game. 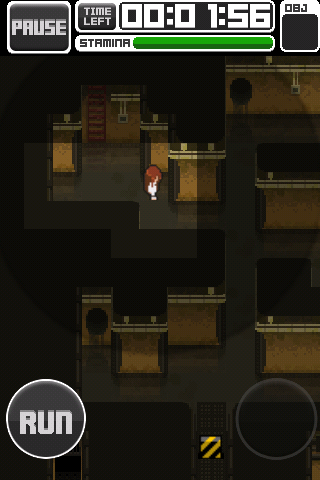 The atmosphere for once is dark gloomy and definitely provides the anxiety in escaping within the player. The only problem I have though is sometimes the paths within the game are not well defined. Sometimes you might mistake a path being able to move through but when doing so, getting stopped by an object. I mean with closer inspection you will find out that indeed there is an object blocking the way by how do you do that when you are being chased by a guard. Other than that, environments and atmosphere are well done. Not spectacular but definitely great in terms of matching the aspects and gameplay of the game. Music and sound effects helps a lot in bringing up the mood and atmosphere as well. Music creates an exhilarating feeling among the players and sound effects give you the needed shock whenever you caught the attention of an enemy. I do hope however for an option to turn the sound off and listen to my own music at times. I mean yeah the music and sound effects are cool but listening over and over again might simply be too much of a bore and eventually turn annoying. The only suggestion I have for the game to make it one hell of a great one would be that of online multiplayer. Maybe a mode where some players play as the guards and one guy escaping? Or maybe even cooperative levels where two players have to work together in order to escape? Wow, think of the possibilities! Simply mind blowing. Multiplayer online gameplay will take this game to a whole new level when executed right. Just think of all the fun chasing another real life player and so on. Global high score record boards will also be a nice add-on. Though there are not a whole lot of levels to play from, the replayability is there with the survival and free modes. Replay the fun and it never dies off as you compete with your friend to see who is the fittest of them all. For $0.99, Jailbreak: Voice Onrush is a great game to get for almost everyone and anyone. Swift, thanks for reviewing Jailbreak: Voice Onrush! Readers, we plan to follow this up with a promotional campaign coming to you real soon.